Last week Saturday was a hayride bonanza. We spent the chilly afternoon at the Boetsma fall party. While the weather was less than perfect the rain held off and we were able to take a couple hayrides, stop to pick a pumpkin from the pumpkin patch (which was "created" by my aunts and uncles who love all these little kids!!! 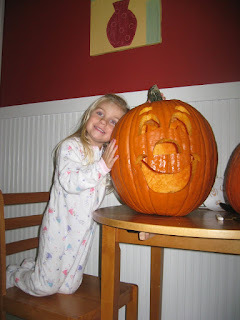 ), paint pumpkins, get candy galore and even roast some hotdogs and smores. 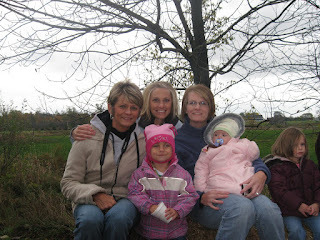 Jenna and I get ready to go on a hayride with Grandma, Aunt Nae and Allee. After having fun all afternoon we headed to Oliver's birthday party where we got to go on another hayride and paint more pumpkins. It was really fun seeing everyone again and as always the kids had a ball. 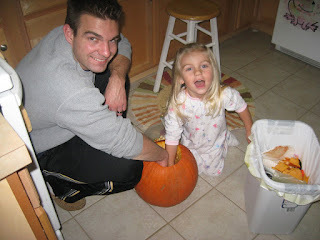 Sunday we managed to finally carve our pumpkins. Jenna thought digging the guts out was fun but lost interest during the carving part....I'm sure being told 100 times she couldn't have a knife played a part in that. She was happy with the end result. We have a small kitchen with a small table so don't mind the fact that we did this on the kitchen floor! 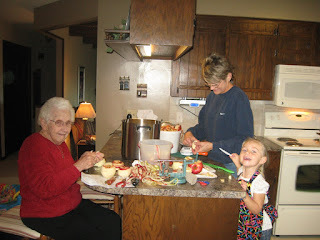 Monday morning we picked up Great Grandma Boetsma and headed to Grandmas house to make some applesauce. Jenna was so excited to wear her new apron from Great Grandma Overway and even more excited that Allee was there since Aunt Nae was home sick. It was a fun way to spend a dreary fall day. We're so lucky to have Great Grandma around to share these times with. She sure doesn't act like she's 91! We got to have Allee at our house yesterday since Aunt Nae was still sick. I think that makes 6 days in a row that Jenna has gotten to see Allee...poor Allee!